The probiotics in yogurt help keep your digestive system running smoothly. And that in turn helps your overall health. For best results, have two 6-ounce servings a day. Oats and barley contain beta-glucan, an antioxidant and antimicrobial which is more powerful than echinacea. According to a study in Norway, these grains can boost your immunity and, if you do get sick, they can help antibiotics work better. For best results, eat at least one serving daily. In addition to keeping vampires away, garlic can help keep you well. A British study showed that people who took garlic extract for 12 weeks were two-thirds less likely to catch cold than people who took a placebo. For best results, eat two raw cloves a day and use garlic in your cooking as often as possible. Selenium in shellfish helps your white blood cells, which fight colds, flu and other illnesses. And the omega-3 in cold-water fish such as salmon and herring reduces inflammation, which helps keep your lungs and airways clear. For best results, eat twice a week – unless you are pregnant or planning to become pregnant. 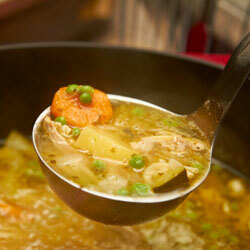 This old home remedy has merit: Researchers have found that chicken soup can help reduce cold symptoms. Add some garlic, and it can help even more. Plus, it just makes you feel better. For best results, eat some whenever you feel sick. In a study, people who drank five cups of black tea a day for two weeks had 10 times as much virus-fighting substance in their blood. The antioxidant that causes that immunity boost is also present in green tea – both regular and decaf. And to increase the antioxidants, bounce your tea bag up and down in your cup as it brews. For best results, drink several cups a day. Beef is a good source of zinc, which can help your body fight infection. Many people don’t get enough zinc, often because they don’t eat any or enough meat. A 3-ounce serving of beef provides about 30 percent of your daily requirement of zinc. Other good sources of zinc include pork, poultry and zinc-fortified cereals. The beta-carotene in sweet potatoes helps keep your skin healthy, and your skin is your body’s first line of defense against germs. A half-cup serving of sweet potatoes provides 40 percent of your daily requirement of beta-carotene. For other good sources of beta-carotene, think orange: carrots, pumpkin, cantaloupe and squash. Mushrooms make your white blood cells more aggressive – and thus more able to fight infections. Though all mushrooms provide a benefit, shitake, maitake and reishi seem to provide the biggest assist. For best results, add an ounce or so to your eggs, salads, pasta sauce, pizza, etc. a couple of times a day.